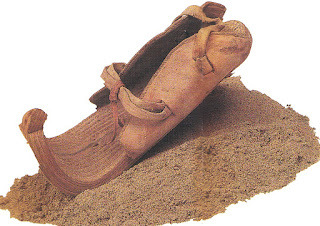 Sandal were the basic footwear of such ancient civilization of Egypt, Greece and Rome. 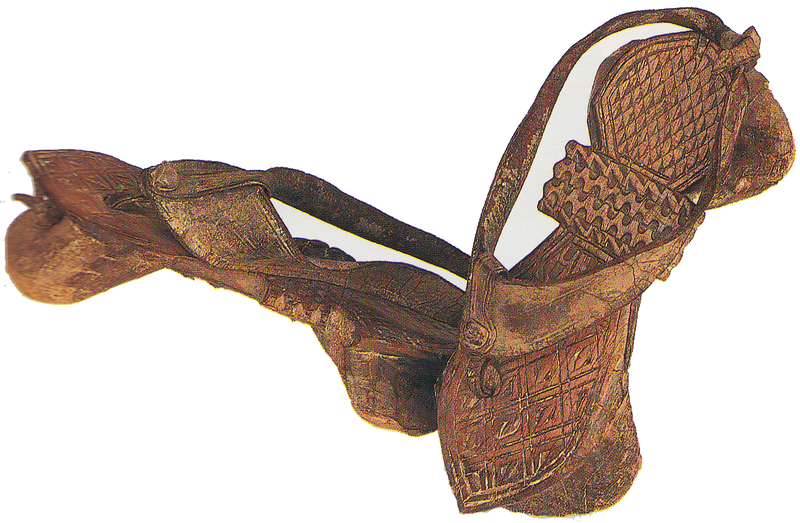 Sandal have been the dominant footwear in the hot climate region of Africa, Asia and the American for centuries. After all sandal are made to order for torrid zones, since their firm soles protect the feet from scorching surfaces, while the minimal uppers allow air to circulate freely. In the 20th century the sandal has been reborn in Europe and north America as fashion footwear. 1. Wooden sandals with toe and heel stilts have been widely worn in Asia and Africa' this pair, attached to the feet with leather toe thongs, comes from the Pakistan-Afghanistan border. 2. These sandals from 19th century Japan are made of iron. 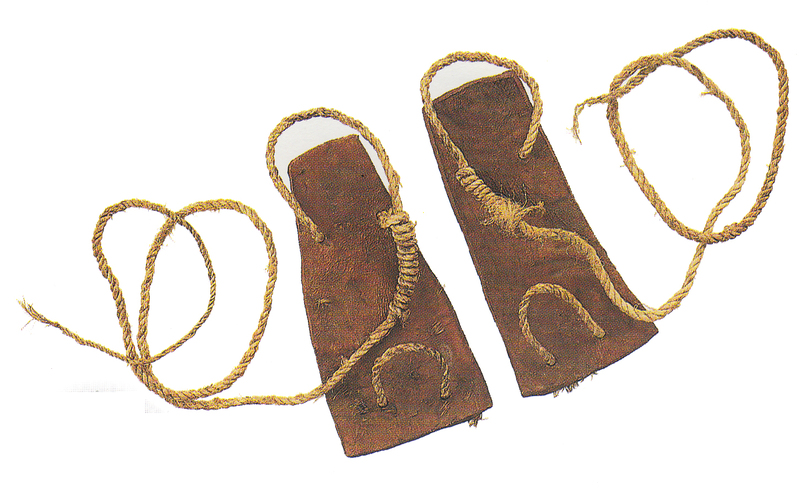 Hemp rope laces threaded through a series of iron loops on the perimeter bind the sandals to the feet. 3. 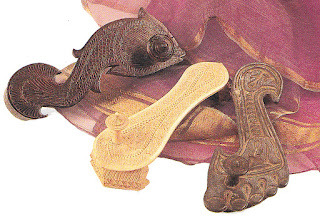 Since cow-leather footwear was not traditionally popular within the Hindu religion, sandals from India were made of wood, ivory or metal, such as the three pictured here, and were variously called "Padukas , Chakris or Kharrows". The toe-knob grip is also a distinctive and centuries-old frature. 4. 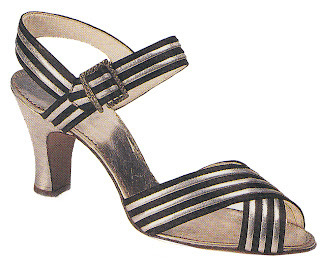 A high-heeled Swiss sandal of silk and kid belongs to the sandal revival of the 1930s. The sandal has remained a fashion staple on women's wardrobes ever since. 5. These concave rawhide sandals with toe loops are from the Acholi people of Uganda and are about 100 years old; the hide has been incised, then pogmented, which results in their colourful pattern. 6. 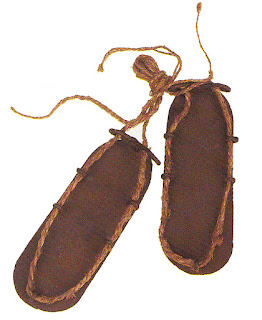 These square-toed, thick-soled sandals are from the Amazon region of South America. The soles are made from readily accessible tapir hide, and rope is attached to form toe loops and heel straps. 7. 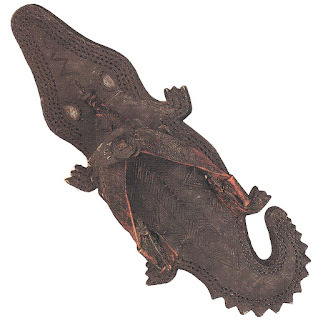 Some sandals visually reflect their geographic origins, such as this crocodile-shaped model that comes from, appropriately, the lagoon district of Ghana. 8. A sandal from Somalia is designed for desert wear. The layered leather sole protect the feet from heat, while the upturned fronts enable the wearer to walk more easily, with a rolling gait, on sand.